Evidence of water and a warmer, wetter climate abound on Mars, but did life ever put its stamp on the Red Planet? Rocks may hold the secret. Knobby protuberances of rock discovered by the Spirit Rover in 2008 near the rock outcrop Home Plate in Gusev Crater caught the attention of scientists back on Earth. 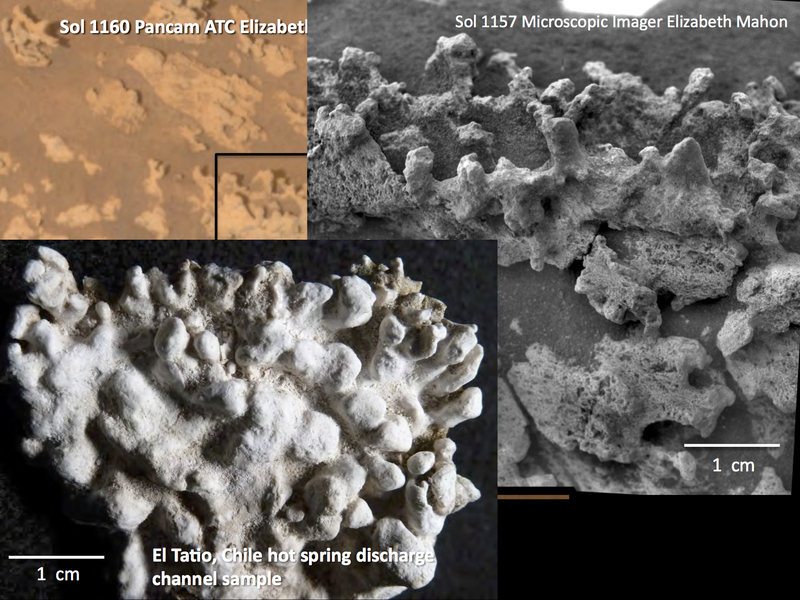 They look like cauliflower or coral, but were these strange Martian rocks sculpted by microbes, wind or some other process? When analyzed by Spirit’s mini-TES (Mini-Thermal Emission Spectrometer), they proved to be made of nearly pure silica (SiO2), a mineral that forms in hot, volcanic environments. Rainwater and snow seep into cracks in the ground and come in contact with rocks heated by magma from below. Heated to hundreds of degrees, the water becomes buoyant and rises back toward the surface, dissolving silica and other minerals along the way before depositing them around a vent or fumarole. Here on Earth, silica precipitated from water leaves a pale border around many Yellowstone National Park’s hot springs. Both at Yellowstone, the Taupo Volcanic Zone in New Zealand and in Iceland, heat-loving bacteria are intimately involved in creating curious bulbous and branching shapes in silica formations that strongly resemble the Martian cauliflower rocks. New research presented at the American Geophysical Union meeting last month by planetary geologist Steven Ruff and geology professor Jack Farmer, both of Arizona State University, explores the possibility that microbes might have been involved in fashioning the Martian rocks, too. The researchers ventured to the remote geyser fields of El Tatio in the Chilean Atacama Desert to study an environment that may have mimicked Gusev Crater billions of years ago when it bubbled with hydrothermal activity. One of the driest places on Earth, the Atacama’s average elevation is 13,000 feet (4 km), exposing it to considerably more UV light from the sun and extreme temperatures ranging from -13°F to 113°F (-10° to 45°C). Outside of parts of Antarctica, it’s about as close to Mars as you’ll find on Earth. Ruff and Farmer studied silica deposits around hot springs and geysers in El Tatio and discovered forms they call “micro-digitate silica structures” similar in appearance and composition to those on Mars (Here’s a photo). The infrared spectra of the two were also a good match. They’re still analyzing the samples to determine if heat-loving microbes may have played a role in their formation, but hypothesize that the features are “micro-stromatolites” much like those found at Yellowstone and Taupo. Stromatolites form when a sticky film of bacteria traps and cements mineral grains to create a thin layer. Other layers form atop that one until a laminar mound or column results. The most ancient stromatolites on Earth may be about 3.5 billion years old. If Ruff finds evidence of biology in the El Tatio formations in the punishing Atacama Desert environment, it puts us one step closer to considering the possibility that ancient bacteria may have been at work on Mars. Silica forms may originate with biology or from non-biological processes like wind, water and other environmental factors. Short of going there and collecting samples, there’s no way to be certain if the cauliflower rocks are imprinted with the signature of past Martian life. But at least we know of a promising place to look during a future sample return mission to the Red Planet. Indeed, according to Ruff, the Columbia Hills inside Gusev Crater he short list of potential sites for the 2020 Mars rover.